The SP PNG Hunters returned to their families on the weekend to spend Christmas and New Year with them. Hunters ended four weeks of pre-season training and will be off for two weeks festive holiday. They will return to camp in Port Moresby in the first week of January to continue their pre-season training leading up to the start of the 2016 Queensland Intrust Cup season. 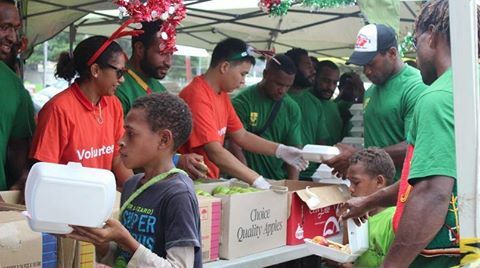 Before they left, the players spent Saturday morning helping to feed hundreds of street kids in Port Moresby at the Street kids Christmas Feast event as part of their community initiative. They also had the opportunity to meet their young fans, take pictures with them and sign autographs on rugby league balls and Hunters merchandise. Assistant coach Nigel Hukula wished all the supporters and fans throughout the country a safe festive season on behalf of the Hunters Club management and players. “Remember that we all have a purpose so always be safe as tomorrow is another day but enjoy today and be blessed,” said Hukula. Hukula also thanked all the fans for the support throughout the year as they look forward to a new season.